A nice thing in NetBeans Platform and IDE 5.0 is the nice Options dialog from the Tools menu. I've developed platform modules on NetBeans Platform 3.6 and skipped the whole 4 release so I'm not sure if it was introduced in release 4 or 5. Anyhow, it's a nicer way to present options to the user than the usual tree display (now in Advanced Options). Also note that the Properties Window is also getting somehow deprecated and not recommended (unless in 3.6 where everyone was drooling to use it). 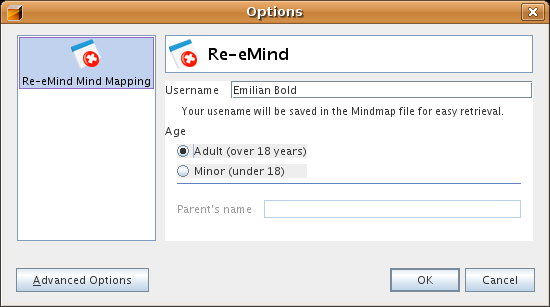 The NetBeans IDE Wizard for a new Options Panel is great. It generates the Bundle, the OptionsCategory , the OptionsPanelController , the swing JPanel, copies the icon and modifies your layer.xml . Basically the AdvancedOption and the OptionsCategory represent the name and icon of your Option panel and also the factory for your Controller. The controller takes care of stuff such as saving your options and loading them, offer listeners and provide data outside such as "does this panel need to be saved ?" Easy short methods that are generated for free by the Wizard. The controller is the one that provides the Swing JComponent for your panel. Of course that people usually have a JPanel (as the wizard generates). Now, a nice thing about this API is that it even takes into account the situation when the settings are invalid. For example the user changed the Country but forgot to update the phone number or something. Because usually it's easy to provide a GUI warning (like a little red icon) but the API must also help. Basically only the load() and store() methods from the JPanel must be filled after you generate the GUI interface with the form editor. I think the SystemOption -s are going to be deprecated or rewritten soon so I use the standard java Preferences. If this was helpful for you then maybe you'll like reading the other NetBeans Platform-related posts. Java-loving consulting services from Timisoara, Romania. NetBeans Platform: Who needs the Web Browser ?